METAL Series is the latest i-tec product line in a stylish elegant metal design and exclusive package. 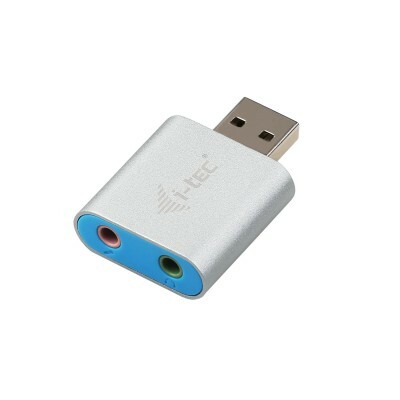 i-tec USB 2.0 Metal Mini Audio Adapter will immediately attract your attention thanks to its elegant metallic design. Audio Adapter provides the user computer with an output for headphones / loudspeakers (STEREO) and input for microphone (MONO) e.g., for listening to music or for Skype communication, etc. It is powered from the USB bus and does not require installation of any drivers. Simply connect it to the USB port of your computer and you can immediately start using it. It is fully compatible with USB 3.0 / 1.1. Thanks to its compact dimensions and low weight it is an ideal companion for your notebook when travelling.